The What: The new SurgeX Axess Manager Platform brings surge elimination, power management and energy intelligence together in a single solution. The What Else: The new platform from SurgeX includes Axess Manager and Axess Manager Mobile, new desktop and mobile apps designed to let users monitor power conditions and control power functions of multiple installations from a single location. SurgeX designed the mobile and desktop apps with convenient admin tools that make it easy to manage device and user permissions without the need for separate licenses or paperwork. The Axess Manager Platform saves money by allowing integrators to hard reboot locked up equipment remotely, or to create a trigger to do it automatically, thus reducing one of the most common service call requests. The SurgeX patented Advanced Series Mode Surge Elimination Technology is completely non-sacrificial and eliminates surge energy without producing harmful side effects such as ground contamination or common-mode disturbances. 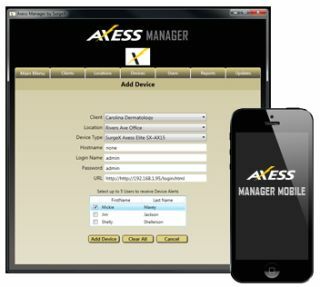 The Bottom Line: The Axess Manager Platform is a mobile power monitoring and management system that pairs with every IP enabled device on a network, including SurgeX Axess, Axess Elite and Axess Ready products, to create the smartest and most accessible energy management system available.